After an awesome five days on Big Island, our Eagle Eye Tours group arrived at Lihue airport late afternoon of Monday, March 17. We headed straight to our accommodations in nearby Wailua – a beautiful hotel property set right behind the beach and overlooking the ocean. Sensing everyone was wiped after our last few busy days, we settled in for a relaxing meal and some light exploration of our immediate surroundings. A driftwood beach and thick, green grass in Wailua, just behind our hotel. 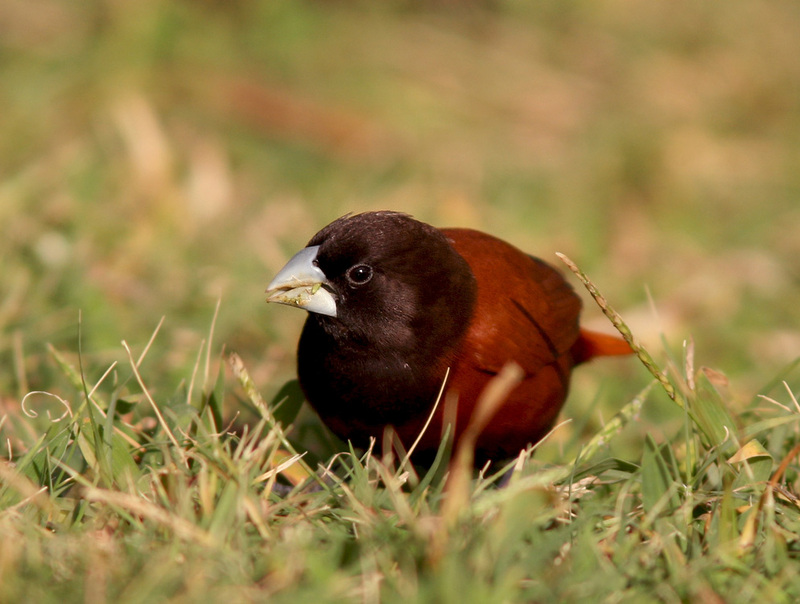 The tiny but brilliantly coloured Chestnut Munia was one of my favourite introduced species in Hawaii. Birding around the hotel produced some great looks at nice birds. Small flocks of Chestnut Munia were often foraging on the manicured grass, Pacific Golden Plovers paraded around the property and nearby beach, and very classy-looking Red-crested Cardinals popped up from time to time. 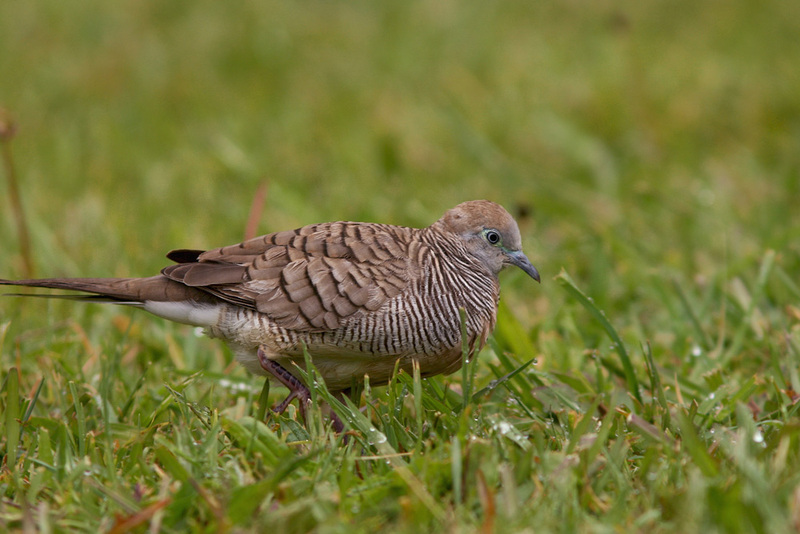 Other birds like Zebra Dove, House Finches and Common Myna were just about everywhere. After picking up some groceries and doing some other “group leader chores”, Jody and I sat back to toast St. Patrick’s Day with a couple cold Guinness. 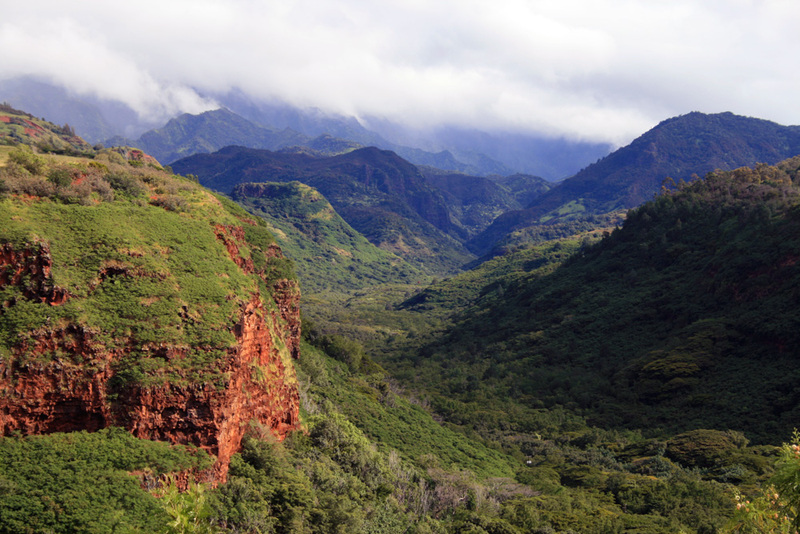 Our first full day on Kauai was spent at one of its most special places – the Alaka’i Wilderness Preserve. 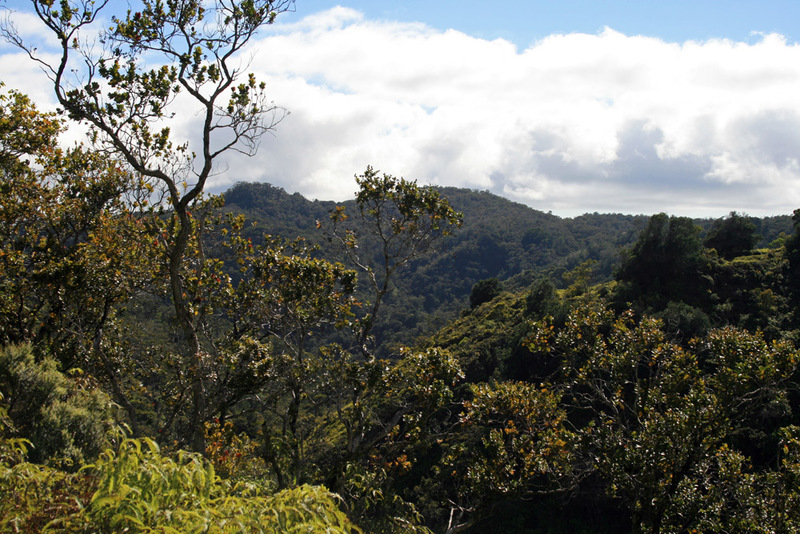 “Alaka’i Swamp”, as it is often called, is a montane wet forest, home to alpine bogs, thick (mostly) native forests, and several species of critically endangered birds. It is also quite wet, being very close to Wai’ale’ale which receives one of the highest annual rainfalls in the world. 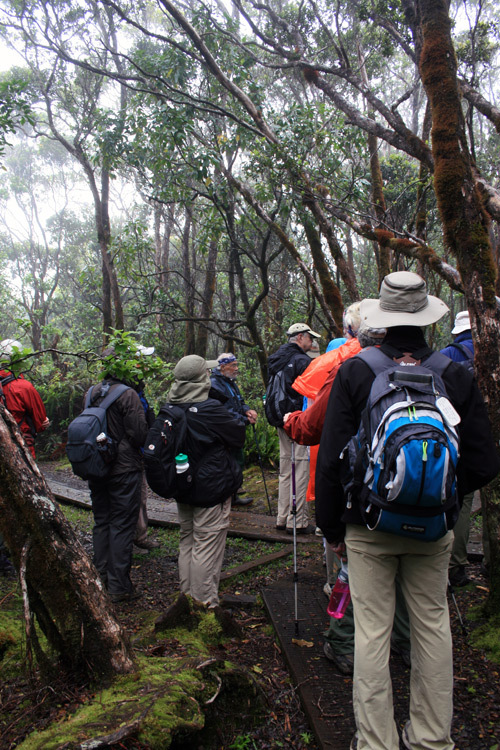 We were extremely fortunate to begin our hike in light rain & fog and make our return in beautiful, sunny weather! 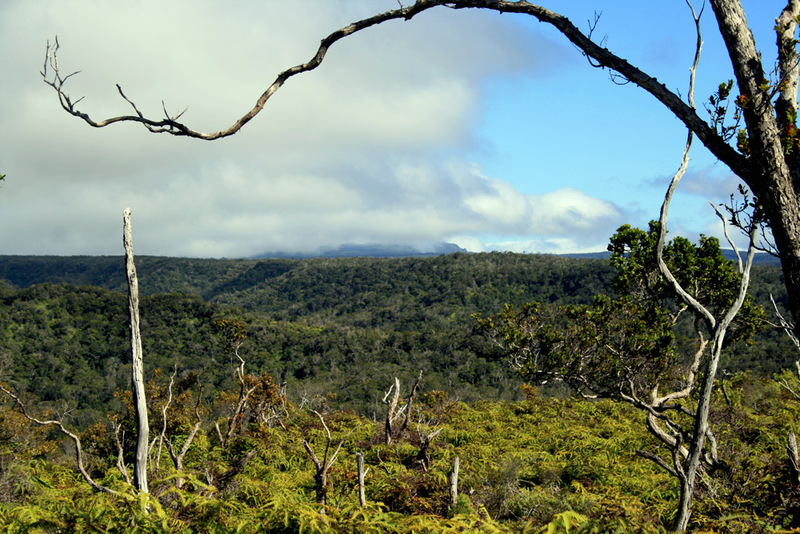 A view of Wai’ale’ale – a mountain peak that is one of the wettest places on earth – from the Alaka’i Swamp trail. We were also extremely fortunate to have prolific Hawaiian birder and author Jim Denny as our guide of the day. The hike in was a little foggy, giving an eerie impression of the surrounding forest and ridges, but was also quite birdy. Apapane called from the treetops, Kauai Amakihi popped in to check us out, and a family group of three Iiwi flicked from limb to limb. Kauai Elepaio were especially cooperative, with several coming in quite close and one even stopping in to watch me eat my lunch. While introduced species were definitely on the scarce side, we did see a number of Japanese White-Eye and heard three Japanese Bush Warblers & two Hwamei (Melodious Laughing Thrush). 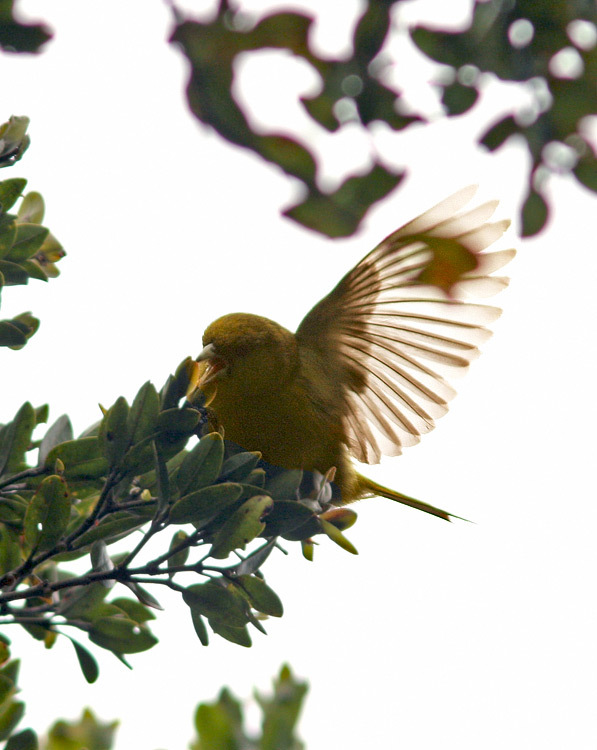 Although putting on a great show, this rare Akeke’e was very difficult to photograph high in the ohia canopy. However, our two main targets for the day were Anianiau and Akeke’e, both small honeycreepers that can be found only on Kauai (and the latter only in Alaka’i Swamp!). Our group managed to find three Anianiau (by far the most abundant of the two species), although all observations were fairly fleeting. The first was heard only, although a yellow blur crossing the path in front of me was likely it. The others were seen foraging about mid-canopy, which is typical for these small yellow-warbler like birds. Akeke’e, on the other hand, has been declining rapidly and becoming more and more difficult to find in the mostly remote forests of Kauai. It is often not seen during tours, and has been a nemesis for Jody on his previous visits. Once we had hiked into an area where they were known to occur (though still tough to find), we were focused on listening for its subtle call and checking every bird that flitted in the treetops. It wasn’t until we were hiking back out of the area and had nearly given up hope that I heard Jody calling out “I got it! I got it!” I had hung behind to take some scenery photos, so dropped my backpack and went crashing along the muddy. root-ridden trail with my camera in one hand and telephoto lens in the other. I eventually spotted the little bird with its distinctive forked tail feeding high above me at the very top of an ohia tree. It continued to forage in the canopy, its actions and feeding style reminding me very much of a crossbill – which is not too surprising. since it too has a bill that is slightly crossed at the tips, designed for opening tasty seeds. 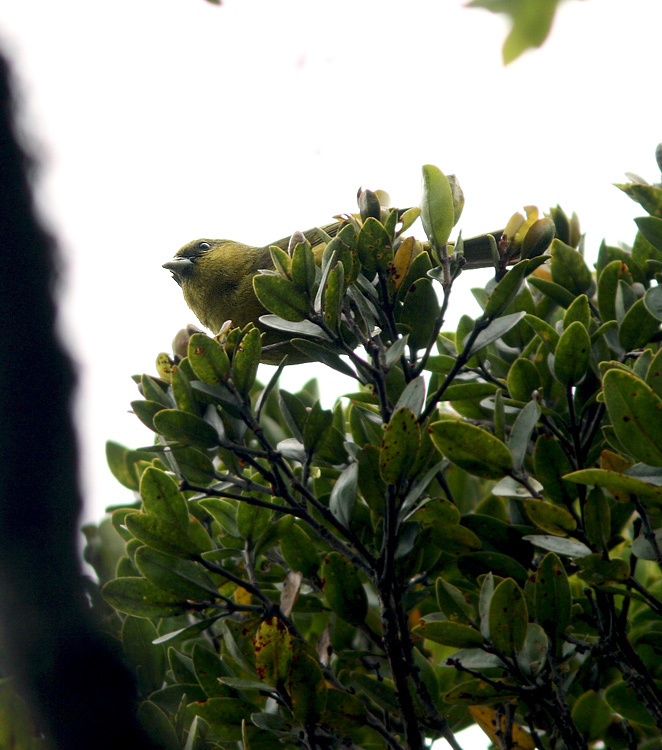 This Akeke’e continued to forage at the very treetops for several minutes while we soaked in the views. In fact, its actions and feeding style reminded me very much of a crossbill – which wasn’t surprising. since it too has a bill that is slightly crossed at the tips, designed for opening tasty seeds. 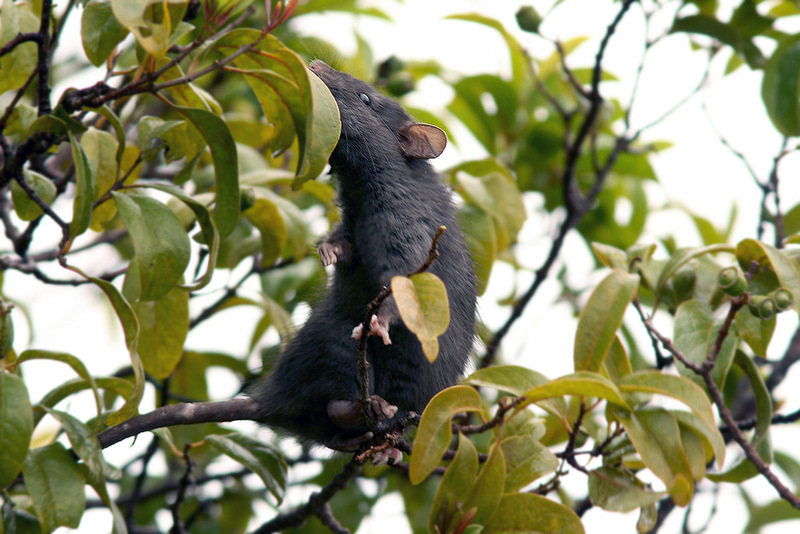 Introduced mammals, such as this Black Rat, have spelled doom for many of Hawaii’s native birds. … and the rare and beautiful birds that can be found in the thick, wet forests only add to the mystique of this amazing place. 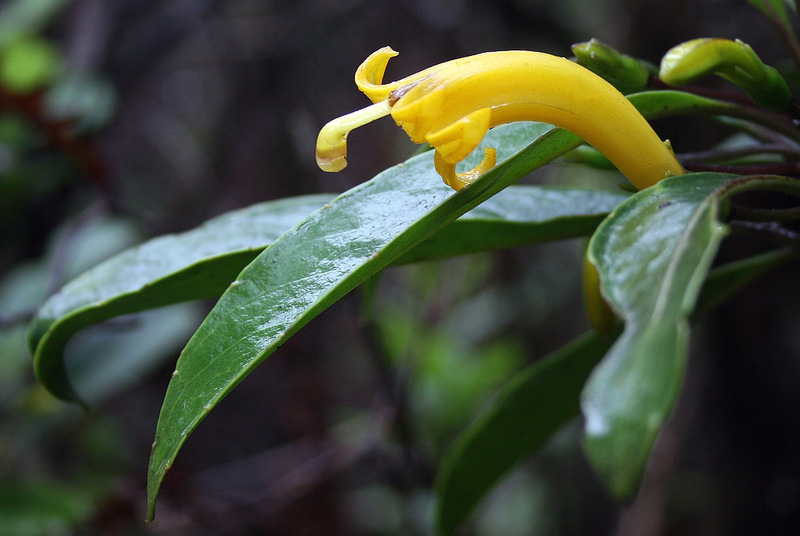 We also observed lots of interesting plants during our hike in Alakai Swamp … such as these native Lobelias whose flowers evolved along with the unique bill shapes of the honeycreepers which pollinated them. Recent declines and extinctions of the birds have been echoed in declining populations of these interdependent plants. 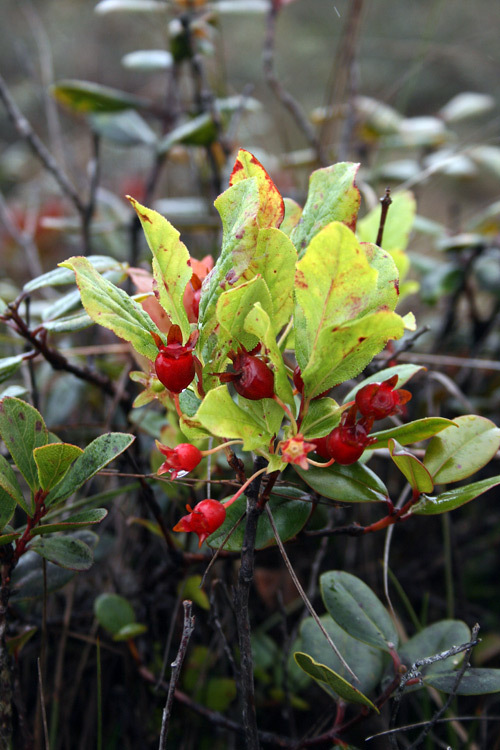 Another native plant, Ohelo is a member of the vaccinium family and related to plants like the blueberry and partridgeberry we know so well here in Newfoundland. 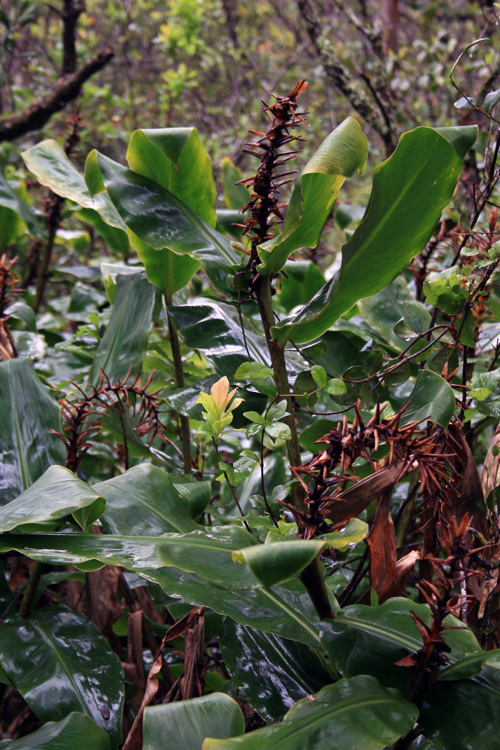 But we also saw lots of introduced and invasive species, such as this Kahili Ginger, which have threatened the survival of many native species. 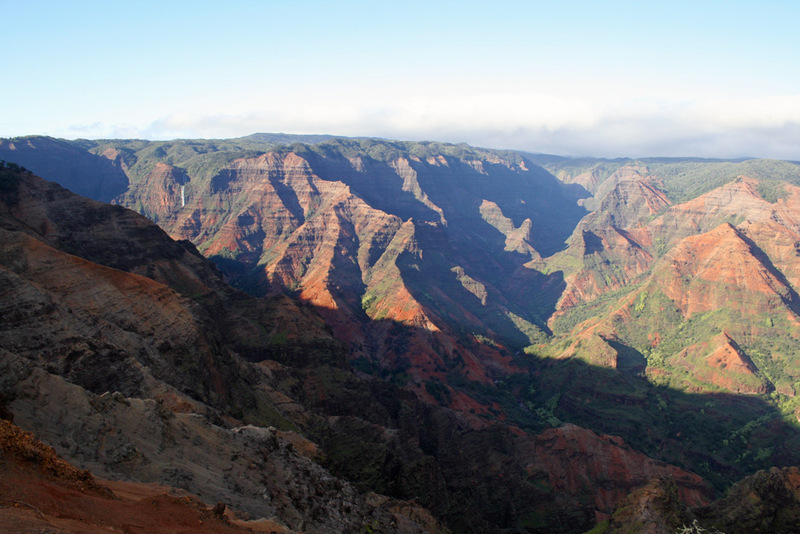 The amazing vistas of Waimea Canyon alone are worth the trek to Kaui’s western flank. 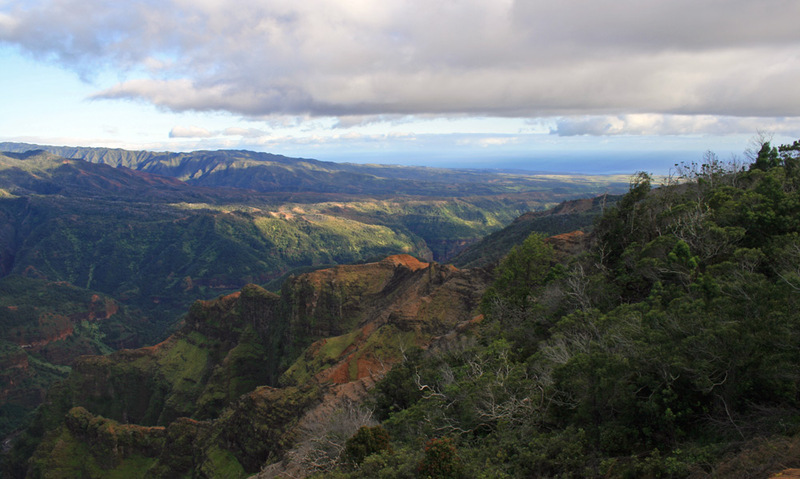 On the drive back, we took advantage of the beautiful weather to stop and enjoy the overlook at Waimea Canyon. 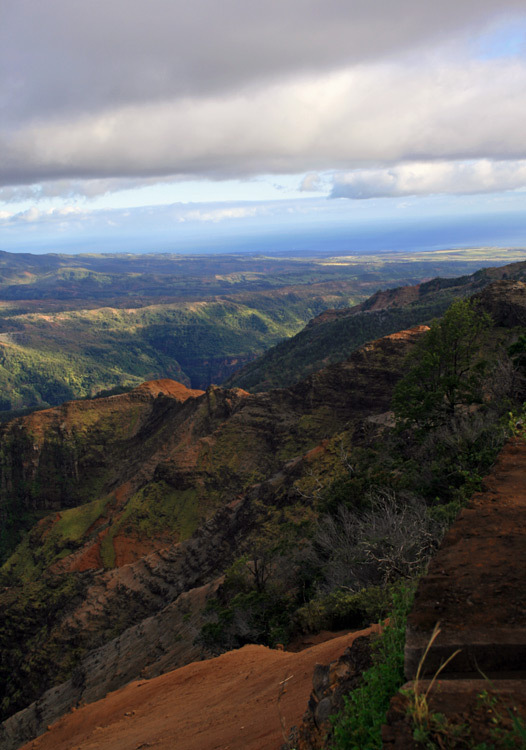 Sometimes called the “Grand Canyon of the Pacific”, the stunning panorama of jagged cliffs, deep gorges and distant waterfalls is breathtaking – definitely one of the most scenic place in all of Hawaii. We were fortunate to be there with the evening light bringing out the deep red colours that give the canyon its name. My photos just don’t do it justice. A view from Kilauea Point. Hundreds of Red-footed Boobies use this particular slope to hang out and raise their young. With the forecast calling for light-moderate NE winds, we decided to spend our second full day on Kauai visiting some prime birding spots along the north coast. Our first port-of-call was Kilauea Point National Wildlife Refuge, with its fabulous scenery and statuesque lighthouse providing a stunning backdrop for a morning of birding. 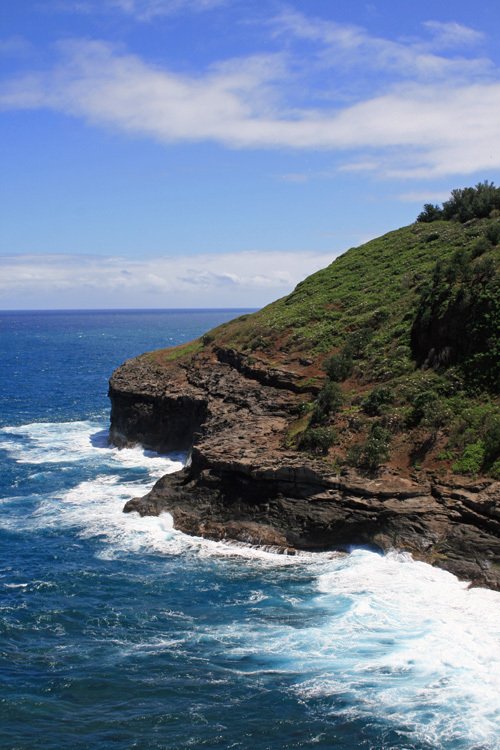 The steep cliffs and grassy slopes of Kilauea Point are home to some of the largest populations of nesting seabirds in Hawaii. This was one of the most anticipated outings for a number of people on the tour (myself included! ), and it didn’t disappoint. 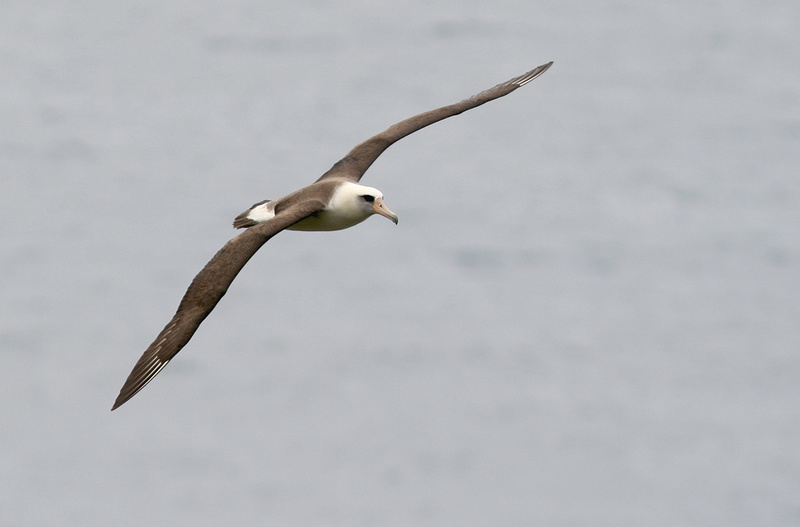 The jaw-dropping birding started before our vans came to a stop in the parking lot, when a Laysan Albatross glided in and sailed right over our windshields. These iconic seabirds, with nearly 6ft wingspans, breed on the grassy slopes in and around the refuge. In fact, using a scope, we were even able to pick out a chick loafing on the wooded hillside west of the point. We also noted numerous Wedge-tailed Shearwater burrows right alongside the walking trails, and even found one snoozing away under thick brush just outside the fence at the main viewing area. It was amusing to hear the eerie “moaning” they are so well known for. A few others were seen later flying way offshore, distant even with scopes. A small group of Humpback Whales frolicked a few hundred metres off the point – although, being from Newfoundland where they are common, I couldn’t bring myself to bother looking at them with so many awesome seabirds zipping by! Laysan Albatross are one of the most recogniable seabirds in their world, with their big stout bodies and long sleek wings. Three Nene (Hawaiian Geese) were seen near the parking lot, while four others were feeding on the grassy “lawn” near the point, quite accustomed to the many onlookers. Despite the fact that I had been looking forward to seeing these classy little geese for quite some time, it was difficult to pay them much heed when Red-footed Boobies and Great Frigatebirds were constantly flying by at close range, often right overhead. A large colony of Red-footed Boobies occupies the hillside just east of the point – Jody’s rough estimate of visible birds amounted to at least 800, and we knew many more were obscured by the trees they nest in and/or flying offshore at any one time. We had several sightings of Brown Booby, which do not breed in the refuge so only pop in as infrequent visitors. 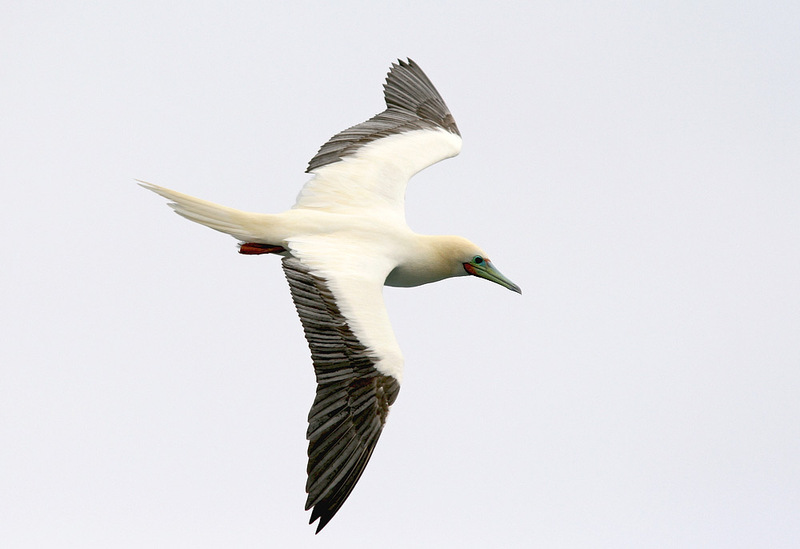 Red=footed Boobies are the most abundant bird at Kilauea Point … hundreds can be seen sitting on snags on the nearby slopes, while others are constantly flying past at close range. Brown Boobies are less common at the refuge, but a few individuals can be seen most days. Most of our observations were a little distant, but this one started coming in for closer views during our return visit right around closing time (4:00pm). 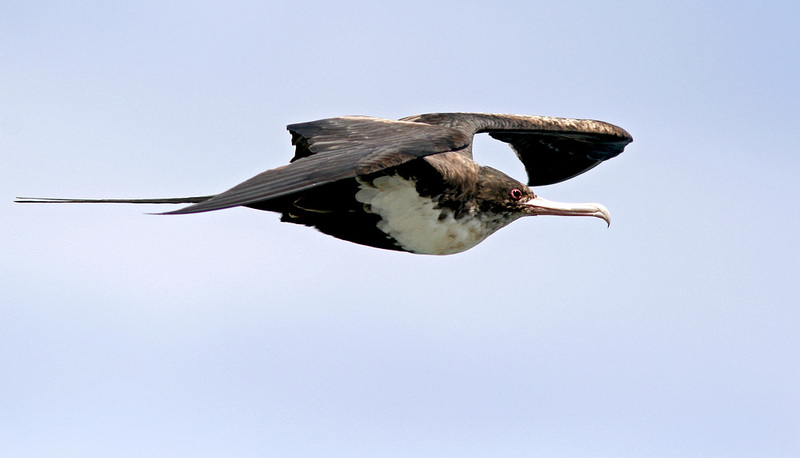 Great Frigatebirds, like this female, often flew in over the point seeming to check us out. Several times we saw them harass the other birds in attempt to steal food – as is their nature. 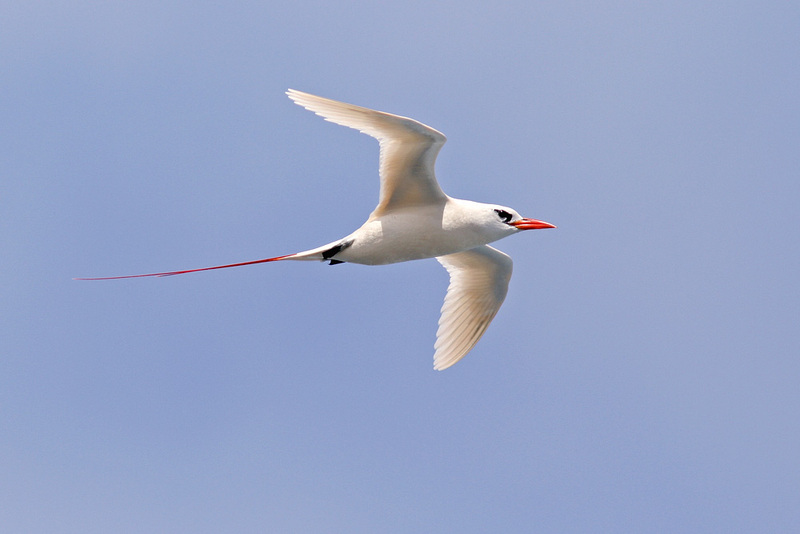 Perhaps my favourite birds of the morning were the Red-tailed Tropicbirds cruising by the point, often very close. They were real show-offs, parading around with their sleek white plumage and brilliant red tail streamers. Several times we saw a pair doing their courtship ritual, cartwheeling around each other in mid-air – sometimes just metres away from us. Stunning birds! A handful of White-tailed Topicbirds were also seen, though usually not as close and somewhat less entertaining (although just as beautiful!). Red-tailed Tropicbirds also nest on the cliffs at Kilauea Point, and were often seen floating by or engaging in their acrobatic courtships displays. 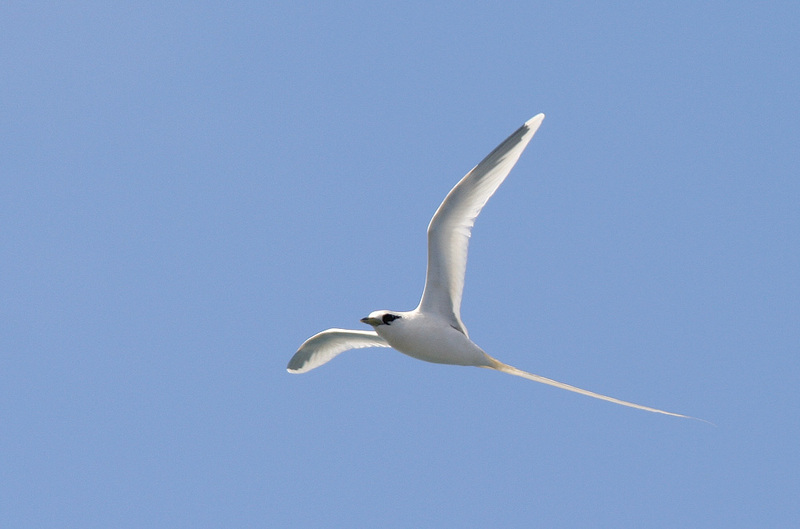 White-tailed Tropicbirds, on the other hand, tend to nest in the canyons further inland. However, a handful of individuals were seen during the day. 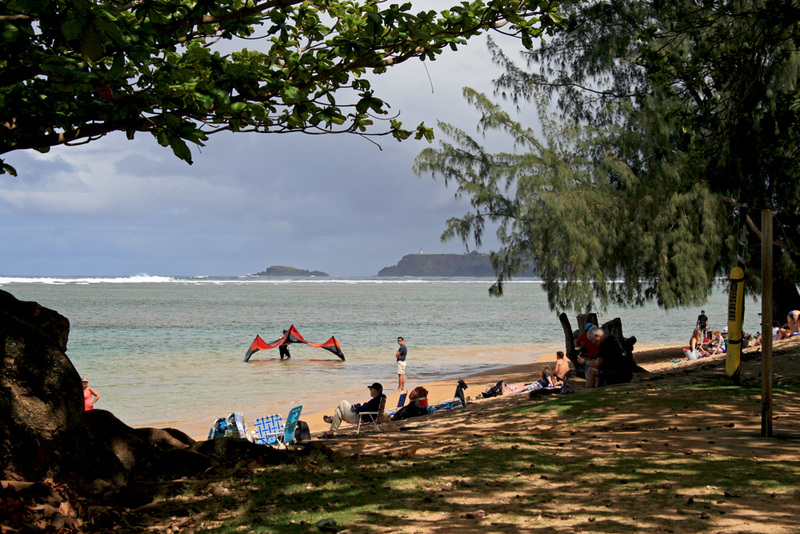 Anini Beach, with Kilauea Point looming in the background. 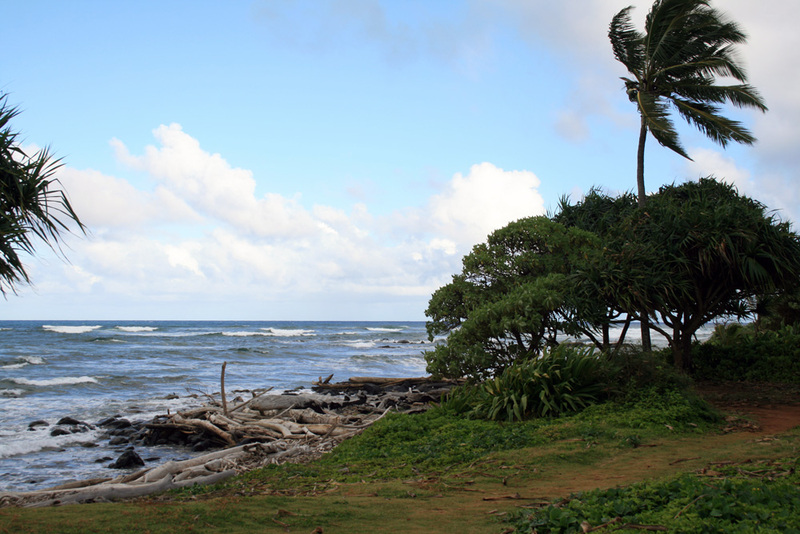 We ate lunch at scenic Anini Beach, where we enjoyed the relaxing atmosphere and beautiful sunny weather. 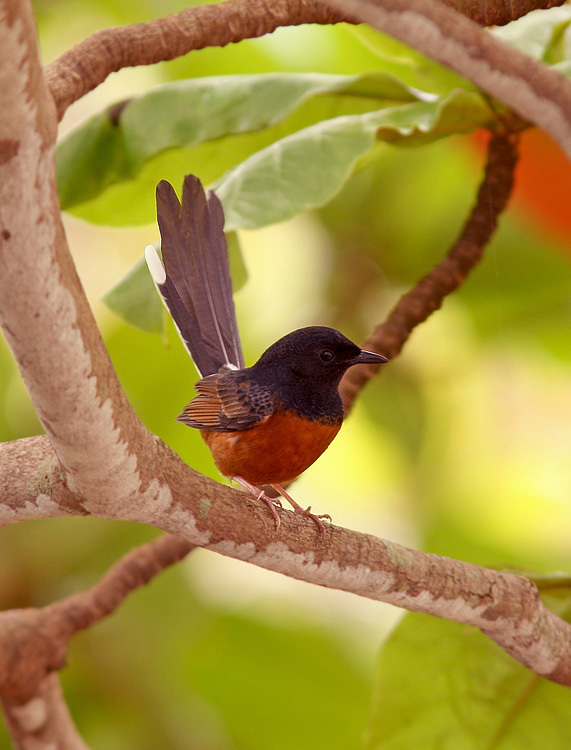 One of our participants discovered a White-rumped Shama across the road, which proved to be unusually cooperative and hung around for the entire group to get great looks. Several Red-crested Cardinals were also loitering around the picnic spot. Our next stop was the Hanalei National Wildlife Refuge, which was set up to protect critical habitat for Hawaii’s endangered water birds. While much of the refuge, consisting of wetlands, riparian pastures and large taro ponds is inaccessible to the public, a portion of it can be viewed from a public road and a large area can be scoped from an overlook on the main highway. The taro ponds, visible from the roadside, were quite active. Pacific Golden Plovers foraged on the grass, Black-crowned Night Herons and Cattle Egrets were standing on the banks and wading in the shallow water. 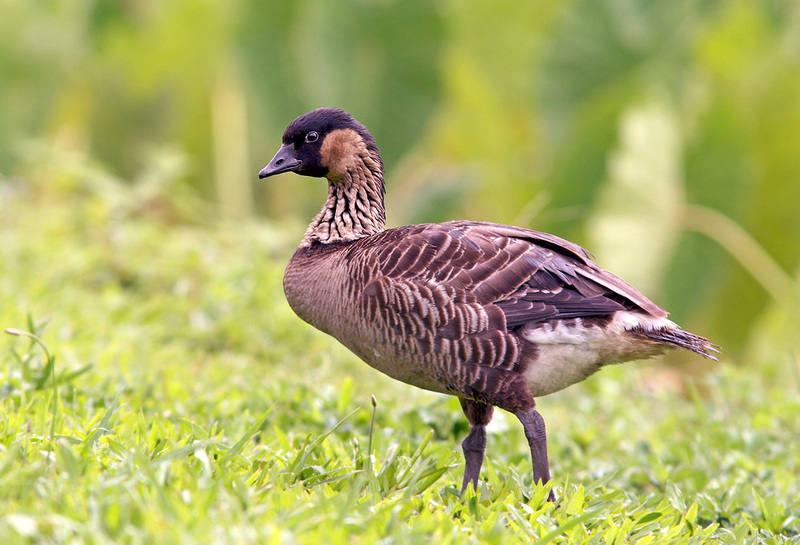 A total of nine Nene (Hawaiian Geese) were also grazing there – most of them very close to the road and allowing for great looks. 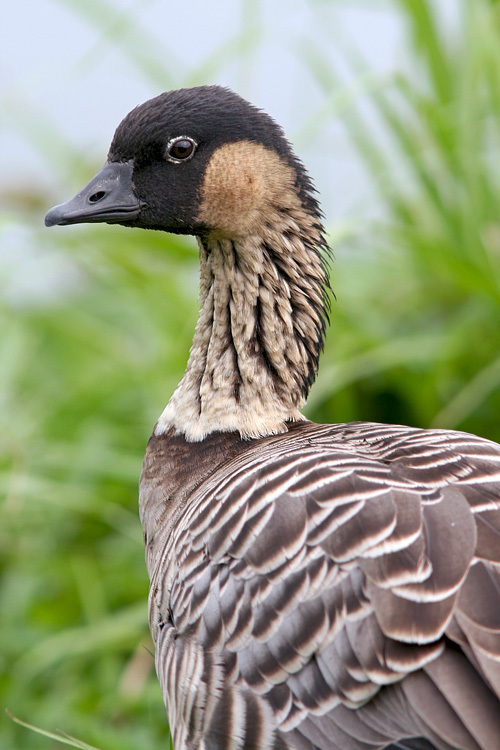 Nene, the official state bird of Hawaii, is an endemic species that evolved from Canada Goose (which likely arrived on the islands more than 500,000 years ago and still shows up in migration from time to time). We also enjoyed our first looks at bona fide Koloa (Hawaiian Duck), which now can only be seen reliably on Kauai. 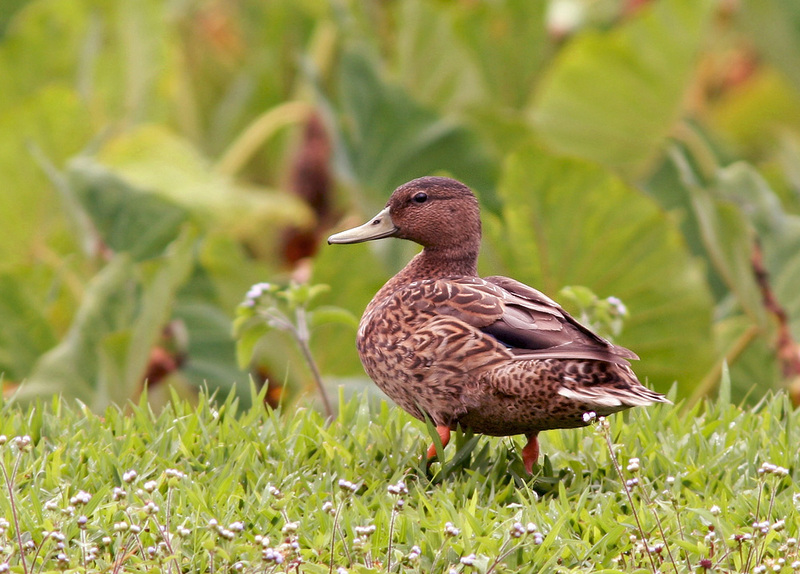 Populations on other islands have been reintroduced and/or primarily consist of individuals that have hybridized with Mallards (We also noted several apparent hybrids on Kauai, despite efforts to control this issue here). Koloa are undoubtedly one of the rarest and most endangered ducks in the world, and could realistically become extinct as a pure species in the near future. A number of Common (Hawaiian) Gallinule and Hawaiian Coots were weaving in and out through the taro patches, enjoying the food and shelter. While the coots are considered a separate (endemic) species, the gallinules are currently considered a subspecies. However, the gallinule population is struggling and is no longer found in many of its former locations (including the islands of Big Island, Maui, Molokai and Lanai). Four Hawaiian (Black-necked) Stilts, another endemic subspecies, were also spotted wading gingerly through the shallow water. The drab Koloa, an endemic and very endangered duck, looks similar to a female Mallard. The two species are close relatives and hybridizes regularly, posing a threat to the Koloa’s survival as a pure species. 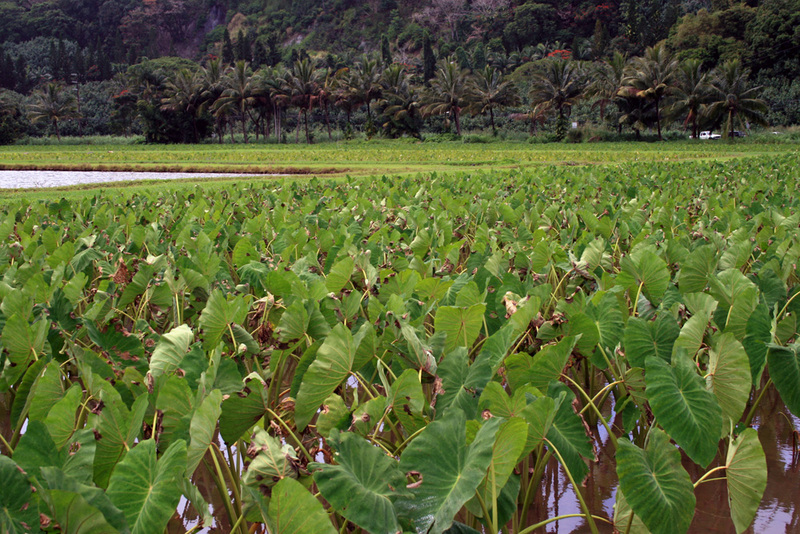 Taro, a staple in both contemporary & traditional Hawaiian diets, is grown on pondields in the Hanalei River valley. These taro ponds are fed by streams and rivers originating on the very wet mountaintops that surround this lush valley. 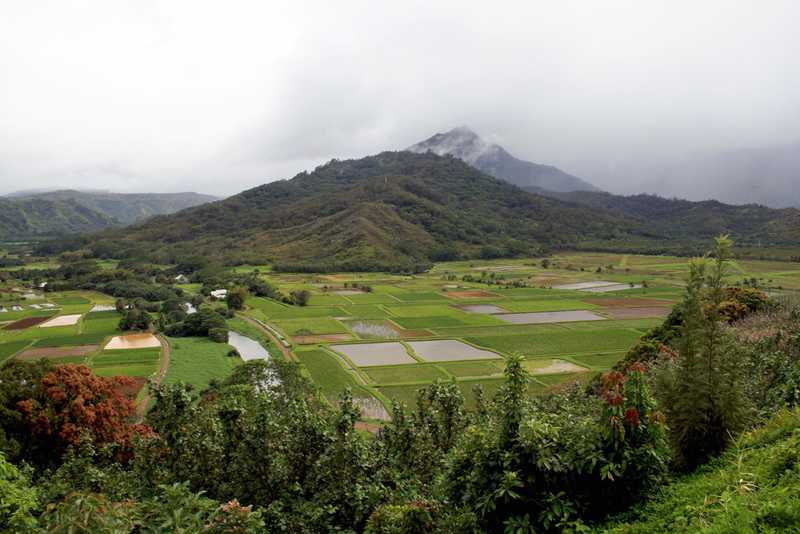 The taro ponds, as seen from an overlook, make up part of the Hanalei National Willife Refuge which in turn provides habitat for Hawaii’s wetland species (several of which are endangered). 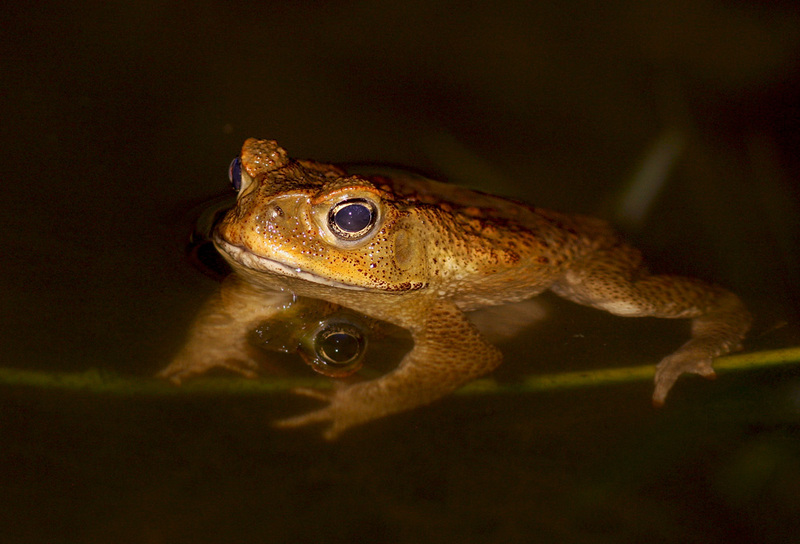 That evening, after returning to Wailua and enjoying a delicious meal of Thai food, I spent a few minutes watching and listening to some Cane Toads around our hotel. With one more full day on Kauai, we headed back to the western side of the island. Our first stop was an overlook near Hanapepe, giving a great view into a lush canyon. It took a few minutes to locate our target bird – Rose-ringed Parakeet – but sure enough we saw several flying through the deep valley. Eventually we found a few more that obliged us by sitting majestically on open branches along the cliffs — great for scope views of these beautiful lime-green birds. The gorgeous view from the Hanapepe lookout was just as eye-popping as they beautiful Rose-ringed Parakeets we had stopped there to see. 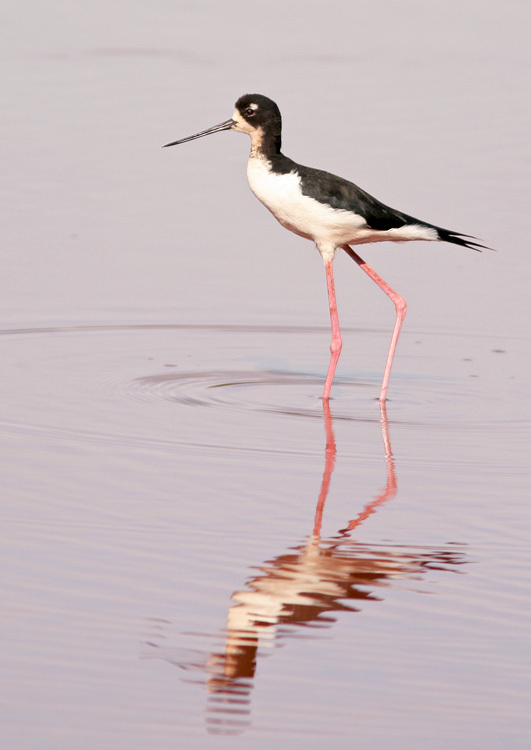 Hawaiian (Black-necked) Stilt is an endemic subspecies and exhibits more black in the head and neck than its mainland cousin. We continued on to a small series of salt ponds near Hanapepe, where several Hawaiian (Black-necked) Stilts and a duo of Wandering Tattler were foraging in the shallow waters and being very vocal. Several Western Meadowlarks were hear singing, and at least two were spotted on the grassy fields of nearby Port Allen airfield. A Black Francolin also put in an appearance on the far side of the airfield, perched nicely on a dead snag for all to enjoy. A quick seawatch from the coast behind the runways was most exciting as I was able to find a Hawaiian Petrel (one of my most wanted birds for the entire trip!!) flying very low along the horizon. Fortunately Jody and one participant were able to get on it before it turned and disappeared behind the waves. We also spotted one Brown Booby and a couple dozen Red-footed Boobies cruising by. Our next stop was Koke’e State Park, where we had started our trek into Alaka’i Swamp two days earlier. This time we were met with periods of heavy rain and shifting fog, dampening our birding efforts and obscuring some of the scenic views we had hoped to enjoy. We placated ourselves with a delicious lunch in the comfort of a picnic shelter and the entertainment of several Red Junglefowl, Pacific Golden Plover and Zebra Doves roaming around the grass. Apapane and Japanese White-eyes flitted around in the nearby trees. 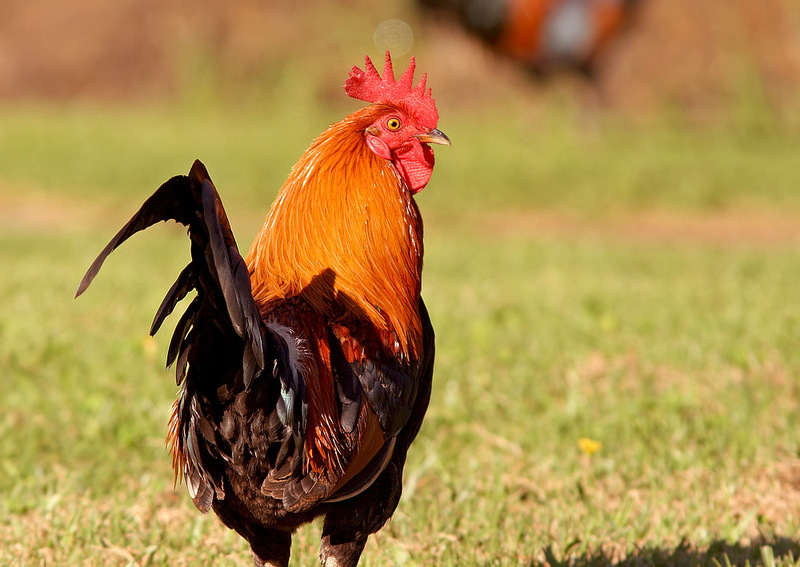 Red Junglefowl were likely the first bird species introduced to the Hawaiian Islands, having been brought over by the original Polynesian settlers. While many of these birds, which are so abundant on Kauai, may be domesticated, wild birds can still be found in more remote places like Koke’e State Park. Leaving the rain-soaked mountains, we stopped to bird at several (sunny!) coastal location on the way back to our hotel. One stop, at the Kawai’ele Sand Mine Bird Sanctuary, was very “birdy” with numerous Black-crowned Night Herons, Cattle Egrets, Ruddy Turnstones and Hawaiian (Black-necked) Stilts, as well as a flock of Nutmeg Mannakin. 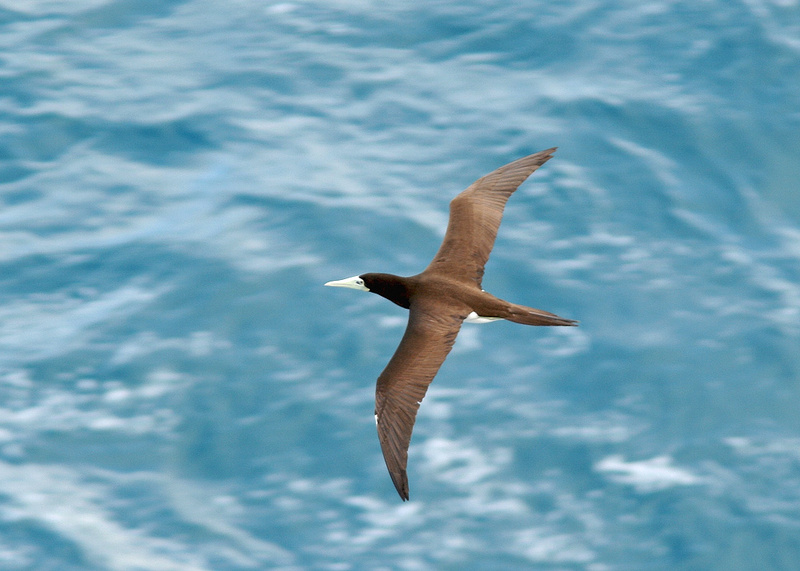 Another stop brought us distant views of a Wedge-tailed Shearwaters feeding over the open ocean, along with both Brown and Red-footed Boobies drifting past. 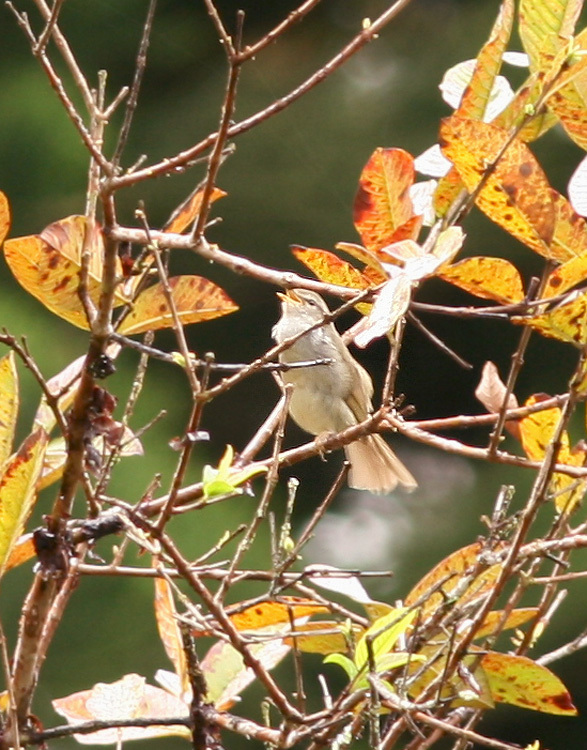 Japanese Bush Warbler, introduced in 1929, is very secretive and often hard to find in the thick understory. We were fortunate to see this one singing its distinctive song. Since our last day in Kauai was also a travel day, we made the most of our morning birding. 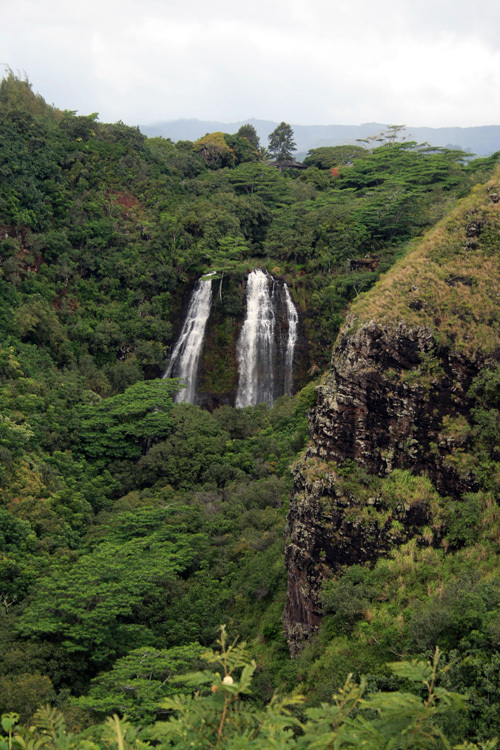 A short drive from our hotel was the Wailua River Valley – consisting of lush neighbourhoods, scenic overlooks and a wonderful walking trail. Our first stop was the Kuilau Trail, which meanders along the valley through tall, green forests and is a great place to see and hear many of the island’s introduced songbirds. We were not disappointed, hearing several secretive Japanese Bush Warblers and then having one pop out and sing in the open for us. We were also able to coax a Hwamei (Melodious Laughing Thrush) from its haunt and it, too, posed momentarily so that the entire group was able to enjoy it before sinking back into hiding. Several White-rumped Shama, Japanese White-eyes, Red-crested Cardinals and a lone Northern Cardinal also joined in, making for a very fun walk. Our last stop of the morning was at the beautiful Opeaka’a Falls, where we enjoyed the serenity for just a few minutes before heading back and preparing for our early afternoon flight to Oahu. This entry was posted in Birding Tours, Birding Trips, Hawaii and tagged Eagle Eye Tours, Hawaii, honeycreepers, Kauai, nature tours, Tours. Bookmark the permalink. ← COMMON REDSHANK – A Mega Falls! !